Over the weekend I made a huge mistake. Its something that doesn’t normally happen. I overlooked a minute detail and it caused a huge impact on the trip I had planned. That detail… mosquitoes. The Superband PREMIUM Insect Repellent Bracelet is the product I wish I had brought with me and will now be stored in my emergency and medical kit from here on out. One thing I am known for is my meticulous preparation. I make lists to keep track of the lists I need to make. I make visual cheat sheets that are tacked up in my gear garage so that I can, at a glance, make sure I’m prepared for anything and everything. So the fact that I forgot about bugs frustrated me even more. Looking at my Emergency and Medical gear packing list you will see that bug repellent is no where to be found. I have remedied that fact. It is actually this fact that makes me love the Superband PREMIUM Insect Repellent Bracelet. Its small and lightweight yet lasts for a very long time. The thing about bug repellent… when you need it you NEED it but the times you don’t need it you will be frustrated by carrying a heavy bottle of bug spray. That’s why I think a product like the Superband is a perfect solution. You can stash it in your pack and forget about it until the bugs strike. The Superband Insect Repellent Bracelet works pretty well. In my experience it performs particularly well when you are not moving around much – think sitting around camp, standing in one place fishing, etc. I think this is because it’s a bracelet that is imbued with natural oils known to discourage bugs. This means that you need to give the bracelet time to create a cloud around you, if you are moving around a lot this can’t happen. Personally this isn’t a drawback since when I’m moving around constantly bugs don’t seem to land on me. With that being said there are products on the market that work better. Bug repellent clothing works brilliantly. Also, the old standby DEET is always a solid solution to bugs. I like to chose the Superband over these two solutions the majority of the time because I would prefer to not rub known toxic chemicals on my skin if I can avoid it. I’ll take a couple random bug bites over the risks associated with DEET. The only time I will turn to a stronger, more effective product than the Superband is when bugs pose danger, like if malaria or other mosquito born diseases are an issue. Don’t be unprepared like I was. 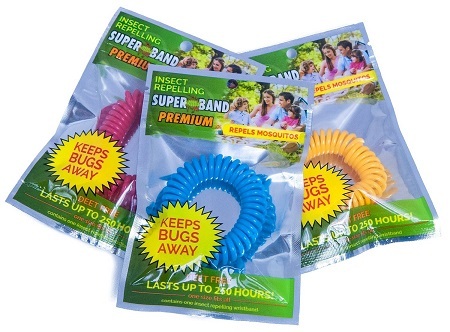 Bring a Superband Premium Insect Repellent Bracelet along on every trip to keep yourself from being part of a bug buffet. This entry was posted in Activities, Activities, Alpine Mountineering, Activities, Backpacking, Gear, Bug Repellent, Activities, Car Camping, Activities, Fishing, Activities, Hiking, Product Review, Activities, White Water Rafting.